Whether your kids are studying, hanging out with friends or lounging around, this your zone flip chair is the perfect addition to any room. 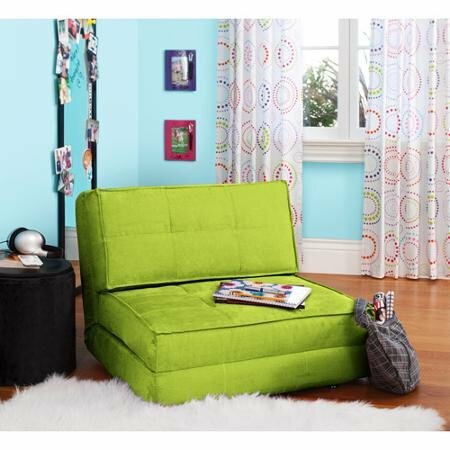 With three convertible positions, it is perfect for small spaces, sleepovers and hang outs. It can unfold into a bed with one part remaining folded to serve as a pillow for guests. It can completely fold up into a comfortable chair and can serve as a reclining lounge chair. The space-saving conversions can be easily made in no time. It is composed of a plush ultra-suede material for added comfort. The material is spot clean only. The trendy and multi-functional chair will add to the ambience of any room. It is available in a variety of colors and patterns. There is no assembly required.